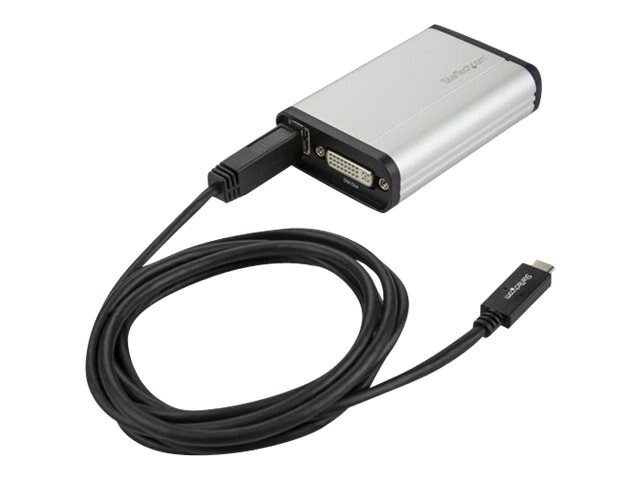 This DVI to USB-C video capture device records high-definition DVI video to your USB-C, USB-A or Thunderbolt 3 computer. With an aluminum enclosure, this device is built strong for fixed-location or on-the-go capture. It offers a separate 3.5 mm audio input for accompanying audio or voice-overs, and a DVI pass-through port for connecting a monitor to review the video as it’s captured. Record 1080p video at 60fps (frames per second), to save your content so it can be shared, stored, or edited. Capture from security equipment, control rooms, medical, or other industrial DVI devices, directly to your computer. This versatile DVI capture device works with HDMI to DVI and VGA to DVI adapters, so you can record video from an HDMI or VGA source.